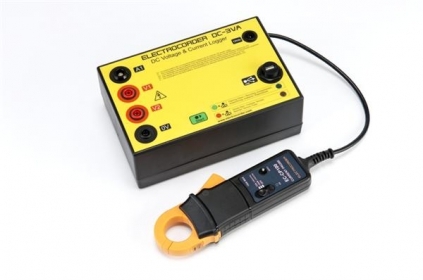 The DC-3VA data logger is ideal for monitoring and recording one or two channels of DC voltages up to 300Vdc and one channel of DC currents on either a 10A-100A, 30A to 300A or 100A to 1kA range; for example from batteries, circuit breaker trip batteries, charging circuits, power supplies, photovoltaic (PV) cells, DC motor circuits, DC Generators, DC telecoms circuits. The advantage of the Electrocorder products over most others is that the data loggers constantly sample information (recording the Min, Max and Average) over the set period. Many other products only take 'snap shots' of what is going on and can miss 99.9% of the data that is critical to your analysis. Kit includes data logger, fused voltage leads, DC current probes, USB lead, 12Vdc PSU, Electrosoft software and carry case. NOTE: Price is for IP43 casing and 10A to 100A Range. For higher ranges, please contact us. For IP65 casing, please select the case option in the recommended products section below. Monitor charging circuits, PV (photovoltaic) cell, DC motor and many other application. Kit includes data logger, fused voltage leads, DC current probes, USB lead, 12Vdc PSU, Electrosoft software and a carry case.